Banks can`t amend Electronic Form-E at any stage, but the exporter can amend Electronic E-Form before it is approved or rejected by the Bank. Once the Bank has approved or rejected Form-E, it cannot be amended by the exporter. If the exporter mistakenly put wrong information at the time of creating online From E issuance request and his request has been approved by the bank so the exporter can`t change Form-E information. How will exporter correct electronic Form E information after approval? Yes! It’s true, we can`t amend Form-E details after approval, so what is a solution, the solution is so simple, first exporter will request the bank to cancel that Form-E and then the exporter again file new form-e issuance request with correct information, that’s all. 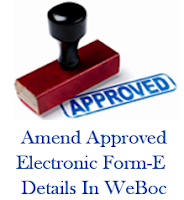 When the exporter ship a quantity less than that declared on Electronic Form-E, So the Banks will negotiate/collect the shipping documents on the basis of value declared/mention in Goods Declaration Form after verification from WeBOC. 1-When the shipment shutout from predetermine vessel and reshipped by another vessel, so approved Electronic Form-E shall remain valid. 2-When the shipment is entirely shutout and is not being reshaped by another vessel, approved Electronic Form-E will be detached by the Customs from the GD Form and can be reused within the original validity period. 1- Banks can cancel Electronic Form-E after it is submitted by the exporter. 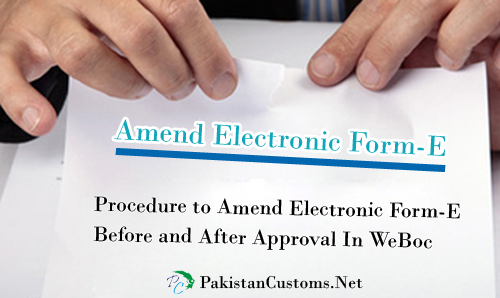 2- Banks can also cancel approved Electronic Form-E before it is attached to GD Form by the exporter. 1- When the bank will not accept the exporter`s Electronic Form-E issuance request within 15 days. 2- When the exporter not use (ship) a Form-E within 45 days from the date of approval.